I hope this series has been helpful to you and your team. If there’s something I haven’t addressed or need to make clearer, please comment or email me (Cyndee AT womensministrytoolbox DOT com). I don’t want to leave you with questions! Thanks! Okay, so the best way I can think to do this is to work backwards. You’ve got to start with the date you have to confirm your lodging numbers. You’ll need to adjust the dates according to the contracts you have signed and direction from your Pastoral staff. Keep in mind these decisions will likely take 1-2 months to determine, if not more. There will be a lot of research involved. Don’t go it alone! Enlist your women’s ministry team to help with the research and decision making. All that being said – God is bigger than any timeline I can put together. I have shared previously that we were not supposed to have a retreat this year. But God impressed upon the hearts of our women’s ministry co-leaders that we were going to go on retreat in spite of their plans. The entire planning process was condensed to 4 months from start to finish. If God says “Go!” then go! Sweet sisters: May God bless and direct your retreat plans. May He send all the help you need to carry out each part and piece. May He forever change the lives of your women that attend. Above all, may He be glorified. Karen, how awesome! So glad God provided just what you needed. He is so good! 🙂 Praying for you as you plan your coaching and training event! I am Karen Pina, and I am a part of the Women Leading Women FB group. I found your site today when you featured a link to the handling dominating team/group members blog article. Then, I found this gem! Thank you so very much. God is leading me to plan a training and coaching event for ministry and business leaders this upcoming October 2016. I know this timeline will prove invaluable. Even though it is not a retreat, there are some transferable lessons here. Thank you, and may God bless you with His richest spiritual blessings. Charmaine, Yeah! So excited for you all! I just know God is going to do great things at your retreat!! Thanks for your sweet, sweet note! Thank you for the wonderful information you have shared here! 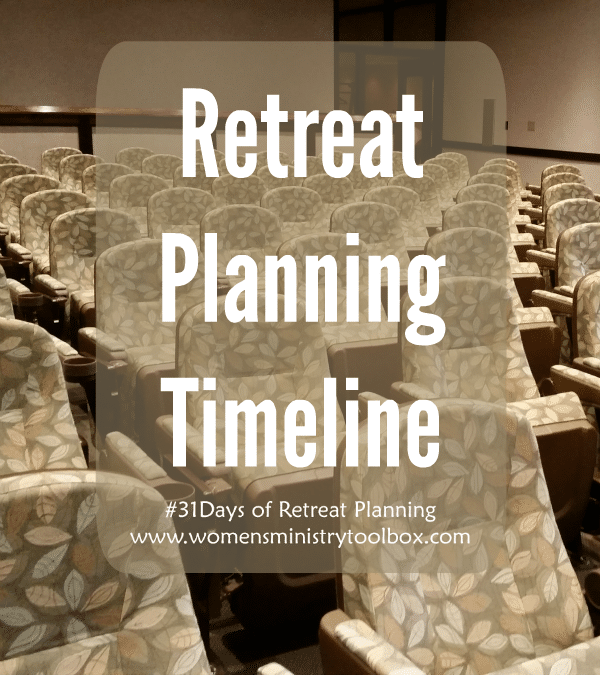 I have been taking mad notes from all of your ideas as we have a retreat coming up in the Fall and it has been several years since our church has held a retreat. Blessings to you a hundred fold for being faithful to encourage and help us carry out God’s perfect plan for each of our churches!! Thank you my sis for your beautiful dedication to the Lord and your passion to equip the women of God.